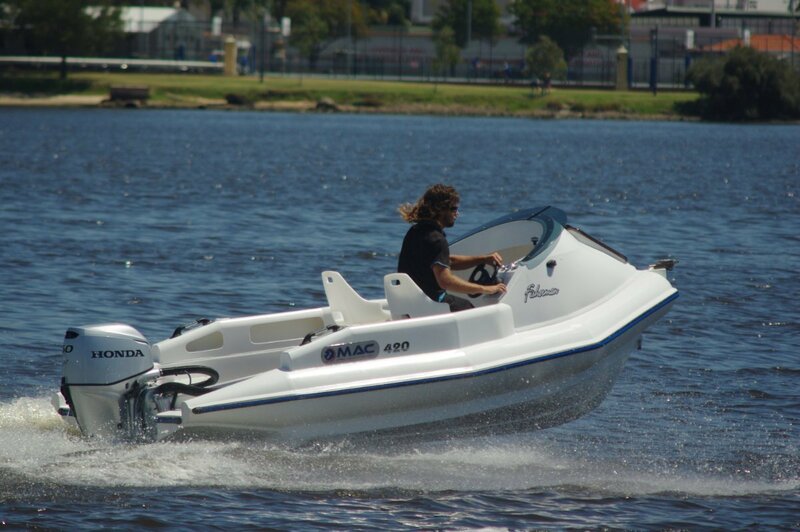 The MAC 420 Fisherman is promoted by its New Zealand builders as a family fishing and diving boat but, driven one up, it was pure fun; a sort of grown up jet ski. Or it was if you drove it like one. 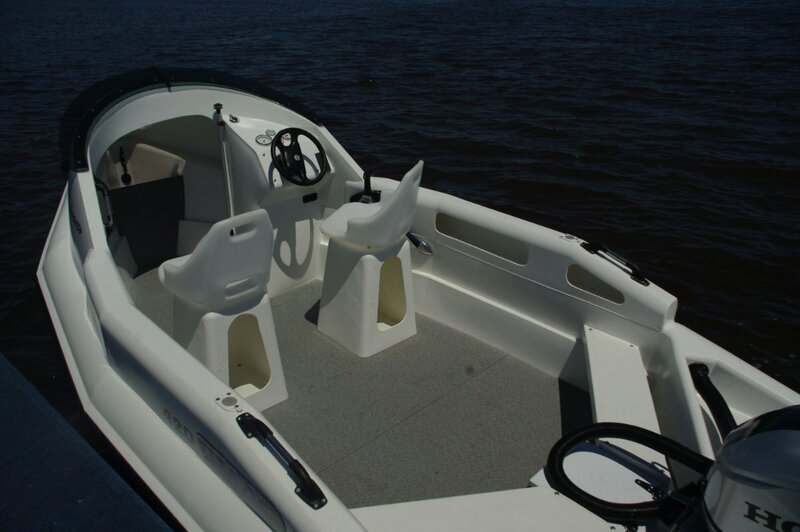 Driven with the respect due to a real boat we could see plenty of appeal at modest cost. MACs are made of rotomoulded polyethylene, double skinned with the cavity between skins filled with polyurethane foam. Since 1912 boat builders have been wary of the word unsinkable, but this would have to go close. Poly construction has a lot of other things to love besides the near certainty of making it home. The hull is next to maintenance-free needing just a hose down after the voyage and the occasional wipe. Casual hits on the jetty are unlikely to leave a mark due to poly’s yielding nature (and also to a powerful rubbing strip), and big hits probably still won’t show due to the colour being full thickness. Pieces gouged out? Low temperature welding will fix them. We are close here to the perfect boat building material. Part of the unbreakable, as distinct from unsinkable, nature of the MAC is due to an absence of locker doors. There are caves below the two simple swivel seats, and side pockets within the hull above the sealed compartments. Essentially, everything on board is visible full time. This boat takes simplicity seriously. The second class seats at the quarters are effectively short planks fitted in diagonally. They meet at the battery box which makes the fifth seat, five being the official people capacity. No rails are fitted, but individual hand grips are provided in key places. There is no shade either, but a Bimini is optional. MAC refers to the semi enclosed space forward as a cuddy cabin. It is actually the space under a foredeck that slopes up from the stem and is topped by a shallow reverse screen. The driver’s console forms a partial bulkhead and, with a curtain or similar in place, there is just room to fit a chemical toilet in it. The anchor well takes up the pointy bit of cabin space, anchoring being done with head, shoulders and waist through the clear fore hatch. A mini bowsprit and roller are laid on. This is described as a fishing and diving boat, so how well does it fit into those roles? To start with this is a surprisingly roomy boat for its modest dimensions. 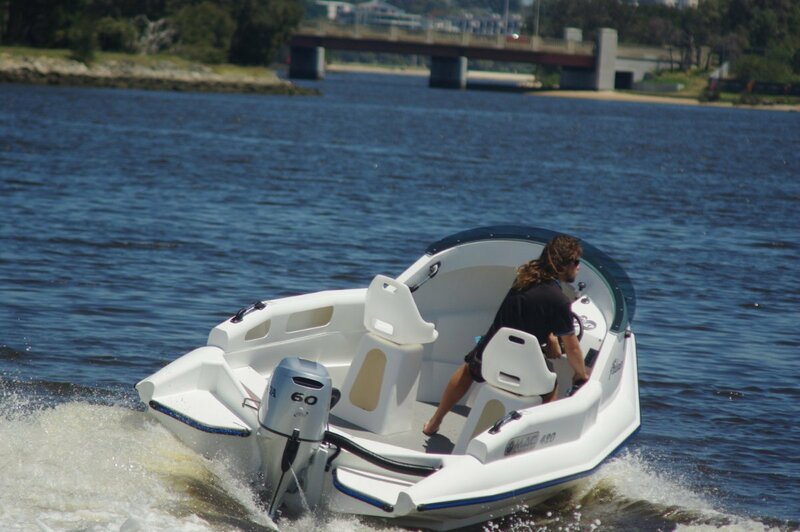 Despite the RIB-style hull internal beam is 1.9 metres, and with the driving position well forward the available deck area is usefully large. It also has surprisingly high sides that are disguised by the boat’s styling. Stability is good too: a touch of initial list when people move towards the side that stops when the semi tube form touches the water. For divers and swimmers MAC lays on a pair of boarding platforms. Beyond that the anglers and divers are on their own, which makes sense: with a small vessel you make do with portable stuff, eskies in particular. You might want to add rod holders to the pair provided, and there are places – in the coamings above the side pockets for one – where you can do this. Recommended power range is 30hp to 60hp. We had the full 60 which accounts for the pure enjoyment on tap. Probably the only worthwhile thing missing was hydraulic steering that would have made the tight manoeuvres lighter on the wheel and quicker. Repetitive tasks such as crab pot hauling also appreciate hydraulics. The ride quality is better than acceptable, made more so by actual and apparent advantages of the construction. The slight flexing of the bottom over ripples and wash has a disproportional effect in smoothing the ride. The virtual silencing of the ride by the non resonant, foam filled hull adds to the overall result. 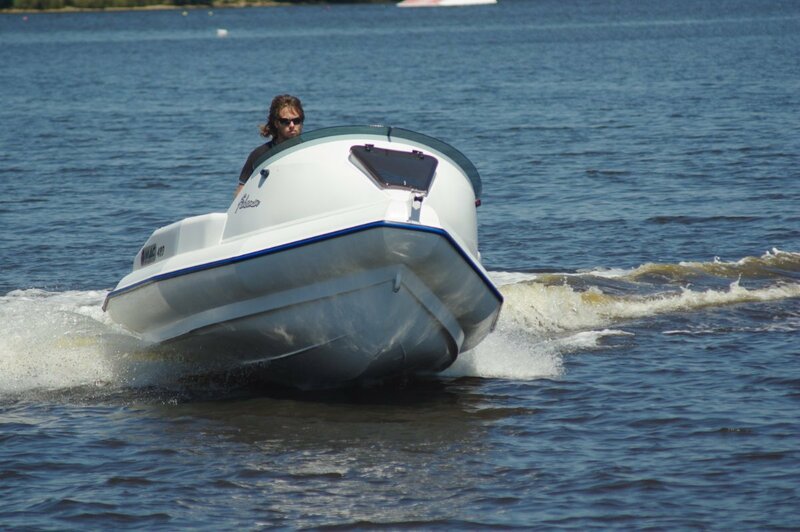 This is a delightful boat, making a virtue of its simplicity and towable by almost any car. Apart from flushing the motor there is almost no regular maintenance required.